This study examined patterns of faunal stratification between vertical strata by partitioning subtidal macroalgal communities into vertically contiguous (and hence paired) canopy and understorey habitats. Such floristic strata are often clearly defined in temperate subtidal communities and have been the focus of a range of other, primarily botanical, studies. Previous studies that have touched upon this subject have used statistical tests that require spatially independent samples, yet have collected samples that are often spatially contiguous and therefore not statistically independent. 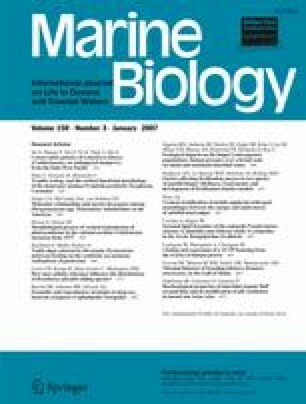 Here an analytical approach for examining faunal stratification in subtidal macroalgal assemblages using split-plot ANOVA for univariate data and a novel multivariate test suitable for analysing assemblage-level paired-sampled data is proposed. Differences in faunal assemblage structure between habitats were primarily attributed to the distribution of two functional feeding groups: filter-feeding and scavenging arthropods. Filter-feeders were more abundant amongst the canopy, whereas scavengers were more abundant in the understorey. No pattern was detected for herbivorous arthropods. These patterns are consistent with the feeding ecology of these functional groups and reflect expected differences in the relative availability of trophic resources between habitats, commensurate with the physical structure of the environments. Contrary to expectation, understorey algal habitats supported faunal assemblages that were as diverse, or more diverse than the canopy habitats, despite comprising smaller habitable spaces (in terms of algal biomass) and generally supporting fewer faunal individuals. Trophic stratification of epifaunal assemblages is suggested as a mechanism whereby faunal diversity is enhanced in these environments. I thank Daryl Metters for considerable help in the field and the Marine Biology Section of Museum Victoria for loan of the air-lift sampler. I would also like to thank G. Poore, R. Peart and D. Staples for help with identification of the invertebrate fauna and B. Baldock and S. Shepherd for help with identification of macroalgae. This manuscript benefited from discussion with and comments from P. Fairweather, S. Smith and three anonymous reviewers. The work was undertaken as part of a Doctor of Philosophy degree at Flinders University, Adelaide and was supported by a Flinders University Postgraduate Scholarship.